Optomec showcased its production grade additive manufacturing systems at the RAPID conference in Orlando, Florida. One included an affordable hybrid CNC system that combines Optomec LENS technology for 3D printed metals with subtractive milling technology in a single machine tool. 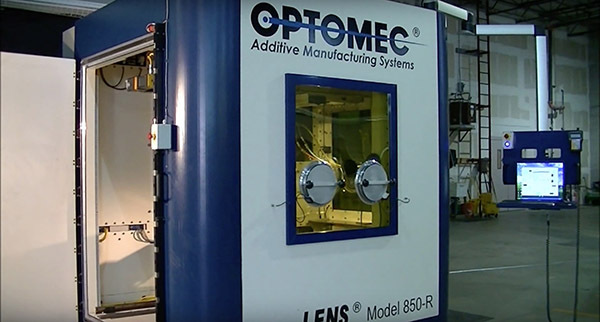 Under a project sponsored by America Makes, Optomec packaged LENS technology into a modular print engine which can be integrated with other metal working platforms such as CNC mills, lathes, robots, custom gantries, or table system. This open system approach lets users deploy metal additive manufacturing technology to meet application specific requirements. Optomec partners, Industrais Viwa, S.A. a distributor of CNC machine tools, and Centroid, a maker of CNC controllers, integrated LENS 3D printing technology into a 4 axis vertical mill. The hybrid CNC system, which was integrated in a matter of a few days, represents the best in additive and subtractive technology in a single machine tool at an affordable price. Global contract manufacturer, LITE-ON, has pioneered a 3D Direct Printing (3DP) solution that enables 3D antenna, sensors and other functional electronics to be printed onto virtually any injection molded part eliminating the need for secondary plating steps – maximizing design flexibility, ensuring optimal device placement and performance, and allowing slimmer product designs. The implementation at LITE-ON leverages a series of Aerosol Jet print modules spread across multiple 5-axis motion platforms, configured to handle common smartphone and tablet form factors. Each machine can print a range of common electronics materials, at a rate of millions of units per year, enabling next generation applications in consumer electronics, automotive, aerospace, and smart IoT devices. Optomec solutions for printed electronics are based on its production proven Aerosol Jet technology for printing conformal electronic circuitry and components onto 3D structures. The Aerosol Jet process uses an aerodynamic focusing technique to collimate a dense mist of material-laden micro droplets into a tightly controlled beam to print features as small as 10 microns or as large as several millimeters in a single pass. A wide assortment of materials can be printed with the Aerosol Jet system including conductive nano-particle inks, polymers and epoxies, along with dielectrics, ceramics, and bio-active materials. Ⓒ INDUSTRIAS VIWA CNC 2016. Todos los derechos reservados. Ninguna sección o contenido de este sitio puede ser reproducido, copiado, modificado o adaptado sin previo consentimiento por escrito del autor.